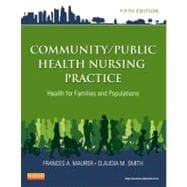 by Maurer, Frances A.; Smith, Claudia M., Ph.D.
A practical approach helps you learn and apply core concepts of community and public health nursing. This text emphasizes both community and family as client, so you'll gain a solid understanding of these important specialties. Numerous real-life examples demonstrate your roles and responsibilities as a community health nurse. Not only is this text your leading source for need-to-know information, it is the only community/public health book to devote a full chapter to screening and referral! A unique chapter on screening and referral details the process of early detection of disease, a significant responsibility of community/public health nursing. Coverage of the community as client includes each step of the nursing process as applied to the community. Family coverage emphasizes the importance of viewing the family as a singular client. A chapter on community assessment provides a complete assessment tool, with application to two different types of communities. Healthy People 2010 boxes, including the Midcourse Review, reinforce the primary prevention aspect of community/public health nursing. A unique discussion describes the difference between geopolitical and social communities. Student-friendly features include Focus Questions, Chapter Outlines, Key Ideas, Learning by Experience and Reflection, and Suggested Readings. Practical application features include Case Studies, Ethics in Practice, and The Nursing Process in Practice. The companion Evolve website includes critical thinking questions, scenarios, and exercises challenging you to apply concepts to clinical situations. The new ANA Standards for Public Health Nursing are addressed in detail, helping you prepare for population-focused practice. The Minnesota Wheel of public health nursing interventions, a widely accepted framework for practice, offers a model for improving population health. Expanded information about managed care, health care reforms, and universal health care initiatives addresses the current issues in health care delivery. New content about Medicare Part D addresses prescription drug coverage and how it affects health care financing for elderly people. Recent national disasters and lessons learned from them are highlighted in a Disaster Management chapter. New coverage of human exposure to environmental chemicals and the impact of global warming on health explain important risks to public health. Expanded coverage of health literacy helps you provide needed patient education. A Study Aids section in each chapter lists the resources available on the companion Evolve website.